An unjailbroken iPhone can only tether by USB or Bluetooth, not wi-fi. Jolicloud does not come with access to Synaptic Package Manager, trading this for ease-of-use. 3. Install Blueman. Whilst still in the Terminal, copy-and-paste this: sudo sh -c "echo 'deb http://ppa.launchpad.net/blueman/ubuntu $(lsb_release -sc) main' >/etc/apt/sources.list.d/blueman.list" and then hit Enter. Follow this typing sudo apt-get update (Enter) and then sudo apt-get install blueman (Enter). You’ll get errors, but don’t worry! 4. Connect to your iPhone. 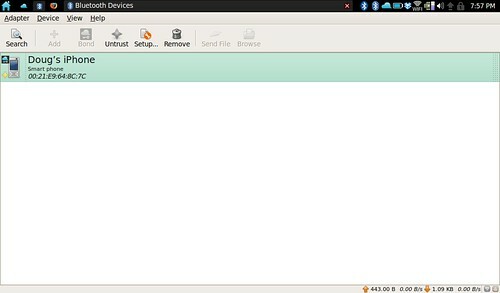 Click on Search within Bluetooth Manager. Your iPhone should be listed. Click on it, then Bond. You’ll have to do the usual thing of setting a passcode to be entered on both devices, etc. 5. Set up your iPhone for ‘tethering’. 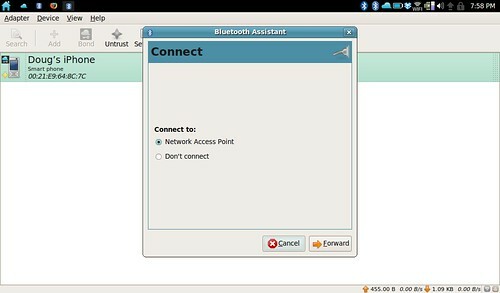 Within Bluetooth Manager click on the Trust button to save time in future. Then click on Setup and keep pressing Forward until your iPhone is ‘tethered’ (i.e. 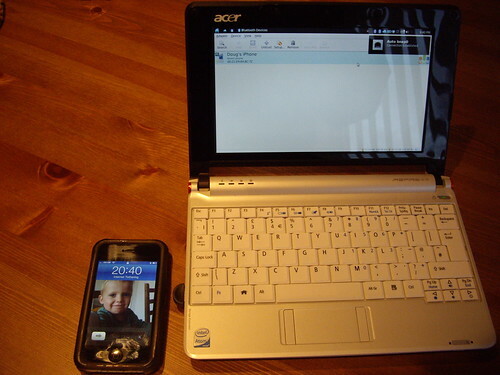 set up for 3G internet access with your netbook). Previous Meeting with Ed.D. thesis supervisor: ‘aspirational naming,’ hegemonic power and finishing early? Have tried doing this but it seems that when terminal looks for blueman it says it cannot be found.”404 not found” Is there a updated link you know of to get blueman?? How do you do if you dont have bluetooth? is it possible to do it via usb? Don’t think so – sorry!